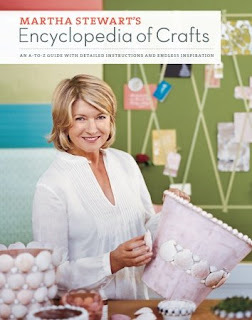 Martha Stewart's Encyclopedia of Crafts is what it says it is: an encyclopedia. Listed in alphabetical order, from albums to wreaths, the book explains each craft's origins, provides a list of materials and detailed how-to instructions with plenty of photos as a guide. The crafts range from fairly easy and inexpensive (pom-pom animals) to the more complicated kind that require a commitment of time and money (candlemaking). Being an encyclopedia, each section gives you a taste of what's involved. I think if you really wanted to know about a particular craft, you'd have enough to peak your interest but might look into the craft further than the book allows. There is also a glossary of tools in the back complete with pictures and a templates section. First off, the book is gorgeous to look at and the photography is perfect. But here's the thing- it looks exactly like the magazine, Martha Stewart Living. Now the magazine is wonderful but I've been a subscriber since 1999 so I've seen a lot of these crafts before. I was also surprised that needle crafts of any kind were left out. However, later the day I received the book I watched the Martha show and she mentioned that they'd be making a book next year just for needle craft. That's good. Looking over the book, I can see crafts I've forgotten about, ones I want to try and ones I know I'll never attempt. If you are in the market for a crafting book, this is good value for your money ($40 CDN), although if you are a longtime subscriber to Living you aren't going to see much new. It does make a great reference book for when you don't feel like pouring through all those old magazines (or maybe it's just me who holds onto that stuff!). Thanks Random House for the book. Publication Date March 31, 2009. You lucky dog! I can't wait to look at this book! Julie- I know! I did a little happy dance when I got it. I love books like this. I can sit and look through them for hours. Great review. I'm very tempted to get this, but I'm not sure if I'd actually use it. I'm more of a cookbook type person. I have the one she came out with recently. I can't remember the name. Thanks for the honest review. she makes me feel so marvelously inept. love her. ha. This looks great! My library has a copy ordered, & I placed a hold. I'm #4 in line...think I can wait? Kristy- Hope I help know matter what you decide. Booklineandsinker- I know! Her crafts always turn our perfect. Somer- Hope you get it soon!